Shamus Award kept the unwanted tag of Australia's best maiden after twice narrowly, once on the track and again in the steward's room, being beaten by Divine Calling in the Group 2 Stutt Stakes tonight at Moonee Valley. The multiple Group placegetter is still chasing that elusive win and trainer Danny O'Brien is holding to his plans to run the quality colt in the Group 1 Caulfield Guineas next start. O'Brien said Shamus Award was not allowed to finish off the race as he would have if not for interference over the final 100m and was dismayed that the protest was not upheld. "It's disappointing as he clearly should have won based on the evidence," O'Brien said. "I can't be prouder of my colt as he had to work hard early to keep his position and he was a sitting duck late, but he was courageous and kept giving and if allowed to run on his merits, he would have won. "We will be sticking to our plan and heading to the Caulfield Guineas if he comes through this run well." By surviving the hotly contested protest Damien Oliver finally won his first Bill Stutt Stakes with the Gai Waterhouse trained galloper. After several placings in the Bill Stutt, Oliver partnered Divine Calling to a short-half-head victory over Shamus Award in the $220,000 Group 2 event. But, Craig Williams fired in a protest alleging interference over the final 100 metres. After a five minute deliberation, Racing Victoria chief steward Terry Bailey dismissed the objection. Bailey said stewards believed there was a shift from both horses and as a result they couldn’t justify changing the placings. Williams said Oliver shifted in and prohibited him from not using his whip in his customary manner. He added that Diving Calling bumped his horse twice and not once did Oliver stop to correct his horse. “His obligation is correct his horse,” said Williams who added his horse didn’t shift its course. Oliver queried what rule said a rider is not allowed to crowd a rider’s whip use. He acknowledged that his horse shifted in, but he said he stopped riding and put the whip away. 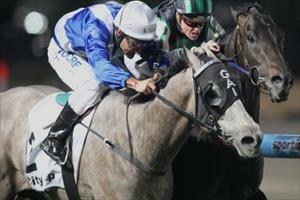 “I felt the majority of the horses coming together was after the winning post,” Oliver said. O’Brien said Oliver clearly shifted in several horses and “crowded and bumped” Shamus Award.